Many known Italian brands – Versace, Valentino, Giambattista Valli, Armani – represent the couture collections in France, and Dolce&Gabbana show fidelity to national roots. Even they translated a set expression of "haute couture" into the native language – alta moda. 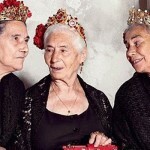 The Dolce&Gabbana Alta Moda collections are presented always in various places of Italy, they are accompanied by parties, dinners and other interesting actions for guests, among which only cream of fashionable community, celebrities of show business, sport and policy, famous secular persons. The spring and summer couture collection of a brand was devoted to the Italian opera therefore no wonder that its display took place at opera theater well-known for the whole world. By the way, it was the first case when in La Scala did not sing and did not dance, and defiled. Though danced too – display was opened by the famous Italian dancer Roberto Ball. And after its brilliant performance on a parquet there were models in really imperial dresses. Some of subjects of this smart collection represent truly couture masterpieces, others can quite be got for solemn occasions or even daily socks.